Hopefully we won’t have a repeat of the tomato hysteria of 2008. Not only did widespread misinformation and continuation of media scares cause a nationwide panic that devastated the country’s farmers and tomato industry, countless people needlessly feared a “tomato death.” Many people may still feel a bit of trepidation about enjoying a tomato salad. This month, the media hasn’t missed an opportunity to continue to heighten scares over “tainted” peanut butter. Few consumers have heard that the source of this outbreak of salmonella (salmonella typhimurium) has already been traced by epidemiologists at state health departments, the CDC and FDA to a single food plant in Blakeley, Georgia (Peanut Corporation of America), which supplies bulk peanut butter ONLY to food manufacturers and commercial institutions. This plant does not sell consumer products, like jars of peanut butter. No national brand of peanut butter is affected. “There is no indication that any national name brand jars of peanut butter sold in retail stores are linked to the PCA recall,” states the FDA. Those jars of peanut butter in your pantry and peanut butter cookies and PB&Js your mother makes have not been linked in any way to this outbreak. Epidemiologists, sticking to what epidemiology does best, found a significant correlation between most people getting sick with a specific strain of salmonella — salmonella typhimurium — and having eaten peanut butter products that originated from this plant. 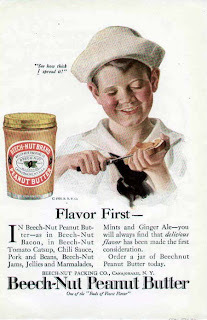 The scientists then tested the hypothesis that this was the cause of the illnesses by testing those peanut products. They found the products tested positive for salmonella, with the exact same DNA fingerprint as the strain of salmonella making people sick. The FDA quickly notified the peanut plant, which issued a voluntary recall of all of the products and lot numbers of products made since July, 2008 (just to be safe) and has stopped all production. The FDA found the same bacteria in two places in the peanut plant, further confirming the source of the outbreak. Health officials with the CDC and FDA say this plant in Georgia is the sole source of the salmonella outbreak. “A combination [of testing and studies] have allowed the FDA to confirm that the sources of the outbreak are peanut butter and peanut paste produced by Peanut Corp. of America at its Blakely, Ga., processing plant,” said Stephen Sundlof, director of food safety for the U.S. Food and Drug Administration. Salmonella is usually killed during the roasting process but there was either a breakdown in this process or the peanuts became contaminated after roasting, but these safety issues are being addressed. Food services have also been alerted and have removed the potentially contaminated products from their kitchens and menus. Americans eat about 700 million pounds of peanut butter every year and peanut butter has not suddenly become a dangerous food. There is no mysterious, spreading epidemic of salmonella-tainted peanut butter, as some media stories lead us to believe. What the public needs to know is just to check their pantries for certain commercial peanut products that are part of the recall and not to eat them. Those are listed on the FDA website (see below). It includes one peanut butter dog biscuit, so don’t forget Fido. 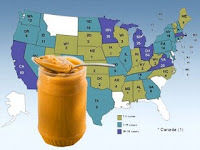 If people are concerned about any other peanut butter product not listed on the recall, they can contact the manufacturer as all are making an effort to confirm and inform their customers if their products were made with the contaminated peanut butter. Since September 2008, the CDC reports that 486 people have gotten sick. As the CDC explains, people who are infected develop gastrointestinal symptoms within 12-72 hours and have “stomach flu-like” symptoms for 4 to 7 days. Most people recover without treatment and by taking extra care to replace fluids lost from the diarrhea. Those with impaired immune symptoms, elderly and babies can become more seriously ill, though. They are urged to contact their healthcare provider. Six deaths are believed linked to this outbreak since September. All of these foodborne illnesses are heartbreaking because they were no fault of their victims. But while the news has been inundating us with sensationalized headlines this week, it’s up to us to turn the panic dial down and keep things in perspective. There are 3,000 deaths every month from car accidents or crossing the street, according to the National Highway Traffic Safety Administration — which means 15,000 people have tragically died during that same 5-month period. Also during that time, about 1.5 million children under age 14 will have been injured playing sports (with traumatic brain injury the leading cause of death), and the CDC reports about 10 Americans die from drowning every day. The news is leading some parents to needlessly feel afraid to make a peanut butter sandwich for their children. Yet, we wouldn’t think to not drive our children or let them walk to school, to not let them play soccer or ride a bike, or not let them take baths. Keeping our children safe is a lot easier when we arm ourselves with the best information.